How Many WordPress Firewalls Should You Install? A frequent question users ask on the WordPress security Facebook group is which WordPress firewall should they install. Typical answer, everyone recommends what he or she uses, which is only fair. But to my surprise, some WordPress users recommended to run multiple WordPress firewalls for the best protection of their website or blog. Running multiple firewalls in a multi tiered web farm? Yes, definitely. But running multiple firewalls in front of a single WordPress installation? That’s an overkill, to say the least. 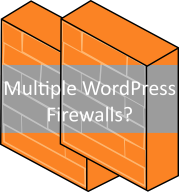 This article explains why running multiple WordPress firewalls is a bad idea. Before you decide which WordPress firewall plugin to install you should first understand what is its scope and role. A WordPress firewall sits between your WordPress and the internet and analyzes every incoming connection request sent to your website. If it is a legitimate request it will allow it through. If it is a malicious request it will block or drop it. For more detailed information about how WordPress firewalls, or better web application firewall work read All you need to know about WordPress firewalls. If you are running two WordPress firewalls every incoming connection request must be analysed by two firewalls, thus slowing down the connection request and eating up more resources. WordPress plugins need to be kept up to date to ensure the security of your WordPress website or blog. As explained in WordPress Security VS Functionality – Striking the Right Balance, you shouldn’t limit the number of WordPress plugins to install on your website, as long as you need their functionality. Though installing plugins with the same functionality is definitely shooting yourself in the foot. The stricter the controls are the more the chances are of blocking legitimate incoming requests. If a WordPress firewall is configured correctly this should not be the case but with two firewalls running back to back in front of your WordPress expect this to happen. Unless you are a seasoned penetration tester or security professional it is very difficult to really test the blocking capabilities of a WordPress firewall. Also in terms of non-security features, there is hardly a firewall that is really much better than the other; they all roughly have the same features. So most of the time it is more a matter of opinion and what your requirements are rather than a matter of which one is the best WordPress firewall. Configure it but don’t go overboard with tightening it down. Previous Article Was Your WordPress Website Hacked by WP White Security? Next Article Was Your WordPress Website Hacked by WP White Security?